In C programming every character has its own ASCII value (Nothing but an integer). Whenever we store a character into the variable, instead of storing the character itself, the ASCII value of that character will be stored. For example, ASCII value for the A is 65. Please refer ASCII Table article to understand the list of ASCII Character and their decimal, Hexadecimal and Octal numbers. 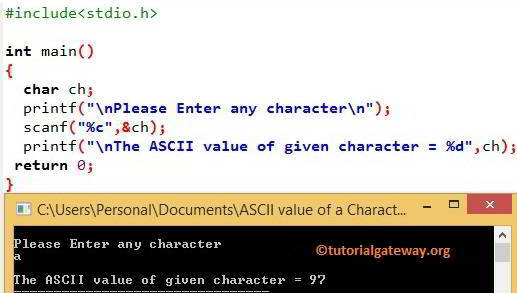 In this article, we will show you, How to write a C Program to find ASCII Value of a Character with an example. 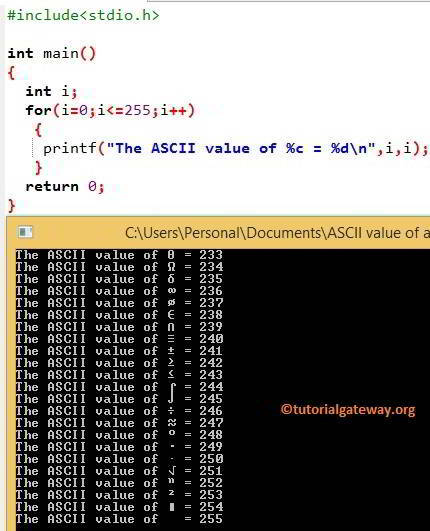 In this C program to find ASCII value of a character, User is asked to enter any character and this program will display the ASCII value of that character. Within this C Program to find ASCII Value of a Character example, First printf statement will ask the user to enter any character and the character will be assigned to variable ch. There is nothing special in 2nd printf statement, We are just displaying the input value but we used the format string %d instead of using %c. That’s why it is displaying integer value (I mean ASCII value). If you want to display the character value then replace %d with %c in the above code. This C program will print ASCII values of all the characters currently present. From the above images (ASCII values Table) of c program to find ascii value of a character example, you can understand that the ASCII values of all the characters in C language will be between 0 and 255. That’s why we used for loop to start at 0 and iterate the loop up to 255. If the number is more than 255 then the condition will fail. 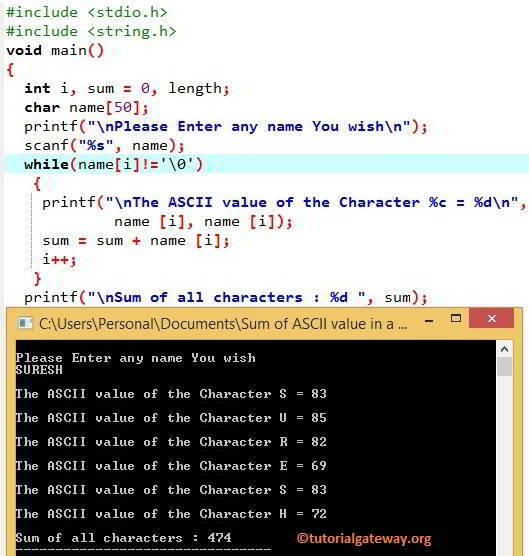 This program to find ascii value of a character in C allows the user to enter any valid string. Next, this C program will display the ASCII value of each individual character present in that string and calculate the Sum of all those ASCII values. First printf statement will ask the user to enter any name or string and that string will be will be assigned to the character array name. While loop will continue iterating until it reaches the special character \0. Once it reached then, the loop will be terminated. In the next line, we are just displaying the individual character and its ASCII value. Next line, we are adding those ASCII values of every character present in the string. Next, we increment the value of i.